For weeks I have debated how I am going to ask my current supervisor at work for a letter of recommendation. And not just one, but many letters over the next two months. It’s caused me so much anxiety. Will he be upset? Will he take it personally? Will he make the work environment awkward? What if he doesn’t support me? What if changes my assignments and lead positions based on me asking him? I’ve had a lot of questions but ultimately here’s how it went down. Last year, I got my current non-profit supervisor and a manager of employee development at my current company to give me recommendations. While many schools say that as many as 50% of the applicants do not get letters of recommendation from current work supervisors, I am sure a recommendation from a current supervisor can make a meaningful impact. Because I was waitlisted last year, I can only assume that my borderline aspects (710 GMAT, non-work supervisor recommendations, mediocre essays, etc) contributed to my borderline admission answer: waitlisted! So I was determined this year would be different. Last year I had a different boss, was in a different group, etc. This is a new chance for me. I have already secured a recommendation from my current supervisor for my non-profit work. So now I am really focusing on my work recommendation. I have already made a lot of progress in my new job. I have been promoted, put in leadership positions and asked to help with special projects. I am determined to ask my current supervisor for his recommendation as I apply to some of the top business schools in the country and fulfill one of my goals that I’ve had since I was in high school. Rather, I should say that I WAS determined…. because I did ask him and . . . .
“I would LOVE to! I think you be great at the top schools! Where do you want to go? How many do you need? When do I ne . . .” I can’t tell you the amount of relief and happiness I am feeling right now. I can’t believe that I had worked up so much anxiety. Now my next step is going to be setting up a “Recommender Package” for both recommenders. The packages will include why I want to go to business school, my short term goals, some recent current examples (as reminders), some character traits I have, my application due dates, and a few gift cards (based on their interests). As with everything I am involved in, I think it is incredibly important to “earn” the help and respect of others. This is the final piece of my HBS application, and I am so EXCITED, that I was able establish this relationship and get the almighty letter of rec!!! Recommenders are such a difficult part of the process (at least if you let them be!) but most people are genuinely enthusiastic …almost scarily so given they’ll be losing you from their organisation and you’re such an amazing person! I’m also making the preparations you mentioned as I’m sure you remember from last time that it takes a few reminders to get the letters prepared and submitted in time. Some schools will only review your application when the recommendations are all received or else it gets knocked to the next round. That’s a fate I’m determined to avoid! Watching your progress with keen interest …and catching you up! That was exactly the same reaction that my boss had and I spent hours wondering about how he might react. I think they are much kinder than we think they are, and despite the fact that we will be leaving the organization soon, the fact that they are willing to support us says a lot! One of my recommenders is my current boss and gave me wonderful insights on giving recommendations. One of his subordinate from the previous company made it to INSEAD and he was aware about the recommendation process. He spent an hour with me to get to the answer why do i require an MBA when I am doing well in my current job. I never thought of making him a recommender’s package. That sounds really cool. Good luck!!!!! You are doing a wonderful job and this blog is becoming very helpful for people who are new to GMAT (as myself). I did learn many new things and those are helping me in keeping track of me and my progress. Thanks. I am going to ask for the recommendation from my current supervisor and manager very soon. 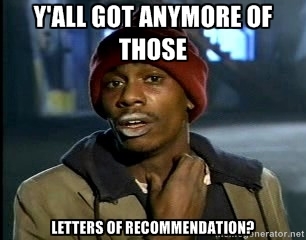 I hope they will write recommendations for me. Btw. I have started a new blog just like yours. Obviously it will not be that much popular as I am half way my preparation but I want to track myself so I am writing one. I hope that will help others too. Keep Writing. Good luck for your recommendations! !